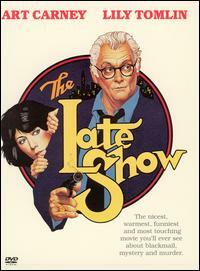 From 1977 it's the Art Carney, Lily Tomlin neo-noir The Late Show. Carney plays Ira Wells, an aging and ulcer-stricken Philip Marlowe type who gets suckered into trying to find Lily Tomlin's cat. Of course things get out of hand rather quickly and soon Carney and Tomlin are thrust into the middle of a web of criminal mischief the particulars of which aren't all that important because this is a detective film in the Chandler mode and the outlandish plot is pretty much beside the point. The Late Show isn't quite a comedy but isn't straight drama either, and it perhaps suffers a bit from an inconsistent tone. Carney (relatively fresh off his Oscar win) and Tomlin carry the movie, and it's as charming a detective film as you're likely to see, however. The Los Angeles of the 1970s is a world you want to enter, and you can't help but like Ira, a man out of time. The Late Show isn't likely to blow anyone's mind or make it anywhere near the top of an AFI list anytime soon, but it's a great way to spend a couple of hours. This one is recommended for fans of Art Carney, Lily Tomlin, Los Angeles, neo-noir, hardboiled detectives, the 1970s, Alka-Seltzer, missing cats.